MIDLAND, NC - Big doings here in my Scuba world. 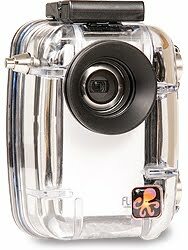 I have a high definition underwater video camera on my terms. You see people often ask me why don’t I take pictures underwater. Number one, an underwater camera capable of going depths of 130 feet is expensive. Number two, I don’t care if I ever see another moray eel or most any wildlife underwater. I don’t dive to see wildlife like the majority of divers do. Oh I do get a rush going up against a school of thousands of fish but basically I dive for different reasons. When I posted that video the other day I got excited about getting a camera because the sights and sounds were so realistic. So I set out to find the best quality camera at a great price. I settled on a Flip Video Camera HD with 2 hour recording time for $117 on eBay. Next was the case. Ikelite makes the best and only case for this Flip Video. They are the standard of the industry and typically a case can run $300 and up. I found one for $246 with no shipping and no sales tax. So while I refused to buy a mediocre video camera for $500, I think I have put together a very good video camera for $363. Plus this case comes with a filter that will assist with color under water. Expect to joint me in my underwater adventures. Congratulations on finding a good deal on your equipment. Excellent stuff! Can't wait to see more! Flip cameras are awesome, that is what Alan uses to film all his stuff for his YouTube channel. Oh and also, I live in River City, don't steal that name! Joint you underwater? Freudian slip? You so Rasta! Haha!